Verbenas are tough. They don't require much water, they love hot summers and they grow well without much care. These flowers, which come in purple, red, salmon, peach, white and multicolor, are excellent container and and garden-bed plants. With a little care, you'll have colorful blooms all summer. Plant verbenas in well-drained soil with lots of coarse organic matter. If you have clay soil, amend it with coarse sand and humus. Verbenas must not be crowded, and they need good air circulation. Choose a location that gets full sun throughout the day. Newly planted verbenas will require a daily watering. After the plants are established, water only once a week unless it's rained more than an inch in the past seven days. Do not water the plants from overhead; place your hose or watering can by the plant's base. Fertilize in mid to late spring with a light application of 16-4-8 fertilizer. You might need to fertilize once more during the summer to promote flowering. If flowering slows, trim the plant back by 25 percent, then water well and fertilize lightly. Replace your verbenas every two or three years. Most verbenas, even those labeled perennial, will not survive a frost, but a heavy mulch may help them make it to spring. Some species will reseed in the garden. To avoid problems with powdery mildew or blight, make sure your verbena gets enough sunlight, isn't crowded, has well-drained soil and doesn't stay too moist. 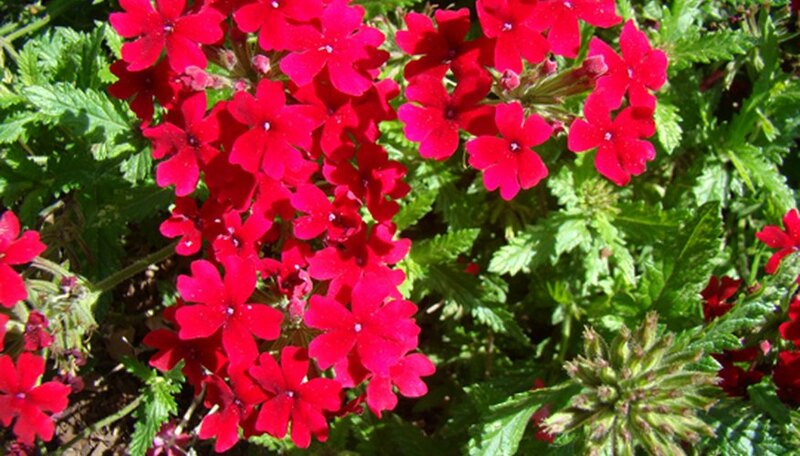 Verbena is an excellent flower for your butterfly garden.